My dad doesn't remember but I have a distinct memory of my Hungarian grandmother making soup with these yellow wax beans. She loved sour cream and would make any excuse she had to put a dollop on this or a dollop on that. 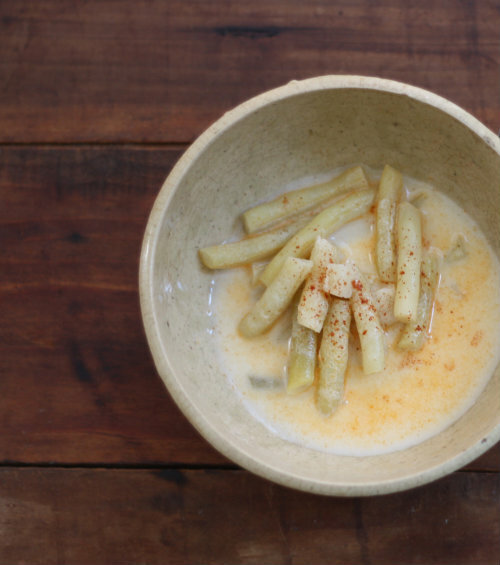 Since this recipe calls for 1 full cup of sour cream, I'm sure that was her draw to this soup — besides the fact she grew these beans right in her own backyard! 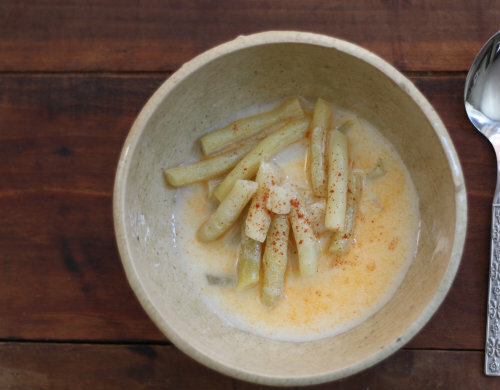 Add salt to the water and bring water to a boil with the celery root. 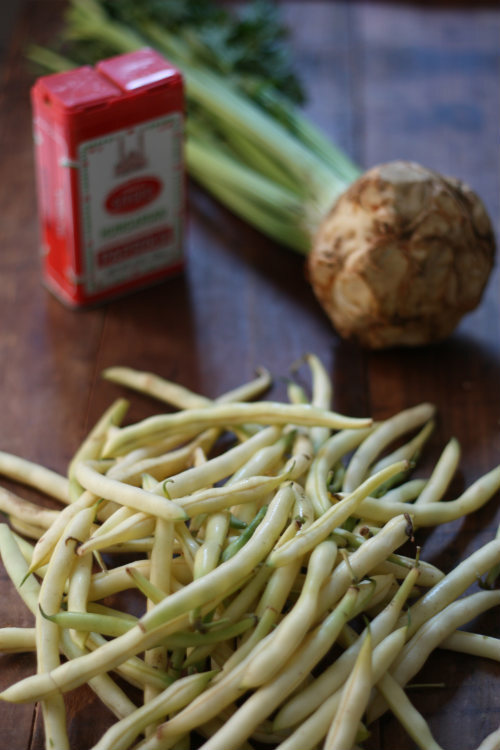 Once the water begins to boil add the yellow wax beans, allowing them to simmer until soft. This will take about 8-10 minutes. Remove from heat and allow the beans to begin cooling in the liquid. Do not drain. The next step is making the roux. Roux's sound intimidating but are really quite simple. 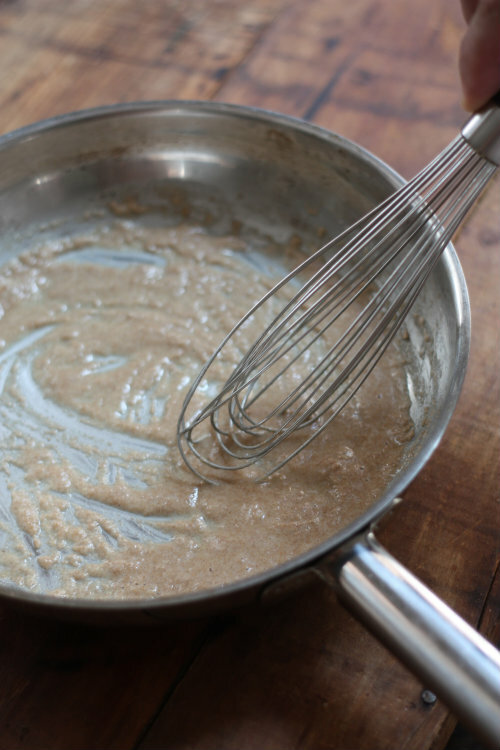 Melt your butter in a sauce pan, add the flour and whisk while on the stove. 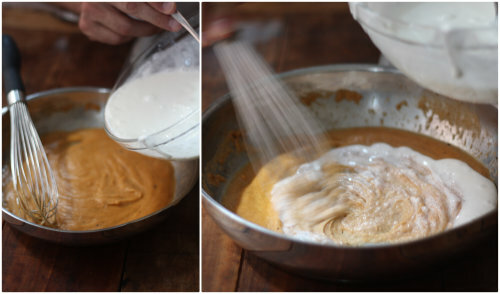 You really want the flour to become a light amber color, so be careful not to burn it. You can remove it from the heat, whisking as needed to obtain this consistency and hue. 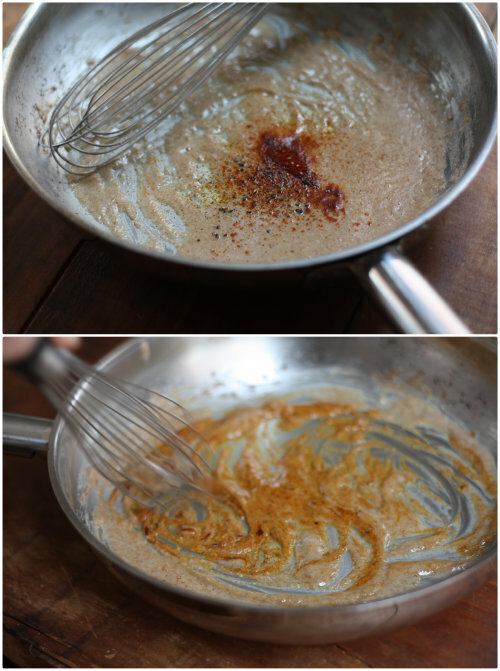 Next we need to add the pepper and paprika, whisking it into the original roux. Take 1/4 of the cooking liquid from the beans and whisk it into the roux. Continue adding up to get a smooth paste like pictured above. Remove from the stove and set aside. Again taking a 1/4 cup of the cooking liquid, slowly pour it into your sour cream, stirring to temper and prevent it from curdling. Once tempered slowly add it to the roux mixture whisking as you pour. 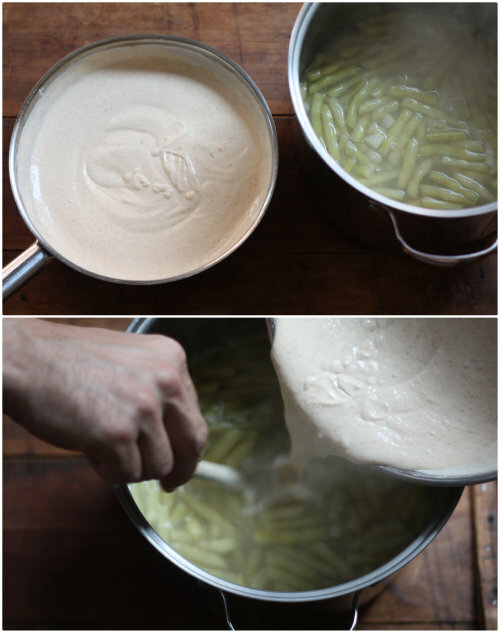 You're going for a thick creamy mixture without chunks, so it take a few steps. We now want to take this mixture and add it to the green beans, stirring to incorporate. Taste and adjust salt and pepper — then call it a done deal! Sprinkle each bowl with paprika before serving. This is a wonderful summer soup of which I have fond memories. It can be served at room temperature, warmed, or my favorite — cold. This looks so delicious. But while I like drooling over your food, I can't help wishing you had your own cafe or something so that you could just make it for us! That would definitely be a stop for us when we were in town! Thank you Katie you are welcome by anytime who knows what I may be cooking! Tara, a little different but oh so good! Let me know what you think once you try it. I also had a Hungarian grandmother [last name Gaspar]who made the most delicious yellow bean soup--however I neglected to record her recipe. I'm going to try yours, using golden wax beans freshly harvested from our kitchen garden, plus some spicy paprika I bought direct from Hungary, to see if it brings back my childhood memories. Thank you! 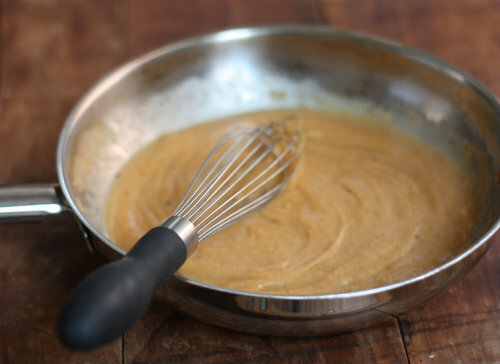 Incidentally, my Nanni always used a Hungarian word for the roux--I don't know how to spell it properly, but it was pronounced something like "Ron-toosh". Does that sound familiar? Thanks again for publishing the recipe. I believe the word you are looking for is rantas so my dad said. Love to hear how your soup turns out and I hope it indeeds stirs some memories! Thank you for posting this, It is very close to my Hungarian mom's recipe. She makes hers with what she calls "habarek", she uses a mixer to blend the flour and sour cream with a bit of milk; once that is smooth it is added to the wax beans in the water. She also adds Vegeta to the water for more flavor and adds a Bay leaf. It is such good soup! Thank you Kathy for taking a look and commenting. I do love this soup so much! Thanks for this. I was just at my uncle's last week and he made a huge pot of this soup. We ate it with fresh bread - absolutely delicious. I'm going to try your recipe this weekend. I'm Romanian and my mom makes this soup the same way. OMG its delicious and brings back childhood memories. So sorry to hear and as a side note when I made this I was talking to my dad about how I remember when Granny made this and he told me he did not remember her ever making it. Well, I know I did not dream this soup up! I'm super late to the party here, but glad I found this recipe! My Hungarian grandmother also used to make this every late summer/fall and it was my absolute favorite. Her recipe actually also calls for vinegar, which I find cuts the richness of the sour cream just perfectly. Have you ever tried that variation? Highly recommend it. Welcome to the party and thanks for commenting. I will have to try some vinegar when those wax beans come in this year. Enjoy! I remember eating this soup at my grandmother's when I was really young. Yes, Hungarian background here too. And then my Mom made it all the time after my grandmother passed away because it was always a favourite of my Dad's when he was growing up and mine as well. I still make it now that I am a grandmother - but for myself - the rest of the family are not big fans of it. It's one of those things that always reminds me of my childhood.......sigh! !